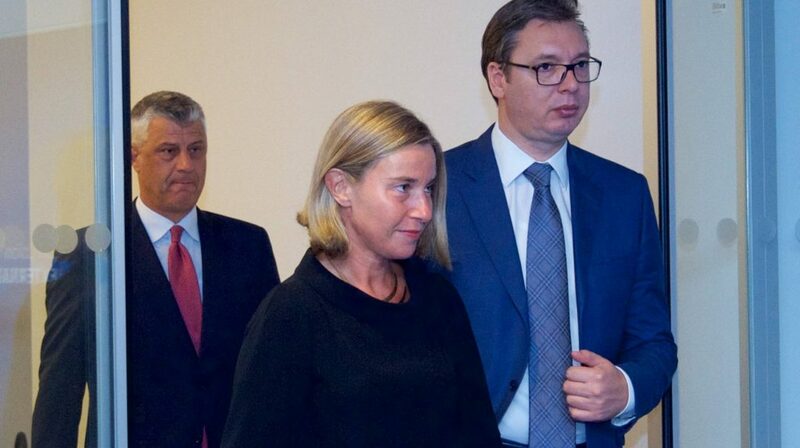 The Dialogue for the Normalization of Relations between Kosovo and Serbia has basically been frozen since last summer, when Serbian President Aleksandar Vučić and Kosovar President Hashim Thaçi announced an undisclosed plan to swap territories, initially with the silent backing of EU’s chief mediator, High Representative Federica Mogherini. All sides agree on the importance of the dialogue, but differ on the pre-conditions and representation issues that need to be solved before going back to talks. In November 2018, the Kosovo government led by Prime Minister Ramush Haradinaj doubled the tariff for goods imported from Serbia and Bosnia. The decision came amidst Serbia’s escalated efforts to undermine Kosovo’s statehood by successfully lobbying to block its membership to international organizations and by pushing countries to withdraw recognition of the youngest state in the Balkans. In recent weeks, the ruling majority adopted a Platform for the Dialogue and it approved a negotiating team. The opposition boycotted both parliamentary sessions. The platform lays out the principles and objectives of the negotiating team. It says that an agreement should be mediated by the EU, supported by the US, and its implementation guaranteed by both. It also foresees that Serbia should stop its activities to undermine Kosovo’s statehood and block its membership in international organizations. Kosovo’s requests are defensive. Demanding the counterpart to stop denying your existence and to cease weakening your statehood are minimal conditions to sit at a negotiating table. The platform can be seen as a sign of Kosovo’s weak position in the dialogue but also of the lack of internal political cohesion. Kosovo’s political parties are divided first and foremost regarding principles of dialogue but also representation in it. The opposition is against any kind of talks involving country’s borders. The majority’s largest PDK party of President Thaçi has floated the idea of swap of territories while its coalition partner AAK party, led by Prime Minister Haradinaj, has fiercely opposed it. This has resulted in a divided parliament, government and a negotiating team with no opposition members. Following months of a public opinion offensive to promote the idea of the positive potential of a plan to swap territories, President Thaçi seems to have withdrawn after realizing that he would not get the public support needed. It was also clear that he would not be able to convince powerful countries in the EU that he and Serbia’s President Aleksandar Vučić could assure a sustainable final agreement, despite the backing of Federica Mogherini. Meanwhile, the general political and public atmosphere in Kosovo remains firmly against swap of territories. President Vučić also seems be losing hope for the territorial swap that he and President Thaçi had allegedly agreed upon. But Thaçi has practically withdrawn from pushing the idea in public and Mogherini is on the way out. Last week President Vučić hinted that Germany and France might soon take the lead in the dialogue. An agreement with Kosovo through exchange of territories would have been easier for Vučić to sell domestically as a victory. Now that such option appears to be getting out of the table and protests against his alleged authoritarian rule are increasing, Vučić needs to satisfy the public in some way. Meanwhile, he has to prepare a new PR strategy to convince his fellow countrymen that the next steps in talks with Kosovo will also be beneficial for Serbia. The aggressive undertone of his recent rhetoric and threats fit this purpose. Indeed, as the chances of a land swap seem to be decreasing, President Vučić’s tone has become more aggressive. Vučić has now conditioned the restart of dialogue on the dropping of tariffs, which is supported by Mogherini. Meanwhile, he has affirmed Serbia’s right to undo Kosovo’s statehood by lobbying for the withdrawal of recognitions and blocking access to international organizations. According to Minister of Foreign Affairs Ivica Dačić, several countries have withdrawn their recognition of Kosovo and the latter’s bids to join UNESCO and INTERPOL failed as a result of Serbia’s lobbying. Other attempts have not stopped there though. Recently, President Vučić’s government removed the Serbian Youth Representative to the board of the Regional Youth Cooperation Office (RYCO) one day ahead of the Board meeting. The removal came in opposition to the meeting location in Pristina. Last week, President Vučić added fuel to the fire his government has kept alight by threatening Kosovo in military terms. He said that Serbia will protect Serbian people in Kosovo in case NATO failed to do so, despite there being no developments posing a danger to Serbs living in the country. Yet, President Vučić does not consider the “old” plan dead. He tried to give it another push when he spoke of the danger of an agreement delay. Playing the regional destabilization card is a favorite move of leaders in the Western Balkans. During President Putin visit to Serbia, Vučić made it clear once again that his country won’t join NATO and is in a strategic partnership with Russia. Now he threatens that Serbia could kindle some sparks that would ignite yet another war, if an agreement is not reached soon enough. In the meantime, the EU is preparing for the June elections. Pushing the weak Kosovo government to withdraw tariffs as the sole condition for the dialogue to restart, while keeping mute on Serbia’s undermining of its statehood, is an easy choice for the EU, albeit an unfair one and marred with double standards. For the time being, it is only convenient for the EU to keep supporting and not disturb President Vučić and other authoritarian leaders in the region in the name of regional stability. However, giving a free pass to President Vučić’s inflammatory rhetoric will surely result in raised tensions in the region, potential destabilization, and bigger problems for the upcoming European Parliament and European Commission. The Western countries should know that.